Fenerbahce Ulker Istanbul extended its road winning streak to six games with a hard-fought 60-68 win over winless Unicaja Malaga on Friday night. Fenerbahce improved to 3-2 record in Group F, while Unicaja dropped to 0-5, registering its tenth consecutive loss in the competition. Andrew Goudelock scored 10 of his 20 points in the key third quarter, which the visitors finished on a 1-10 run to build the biggest lead of the night, 40-49. 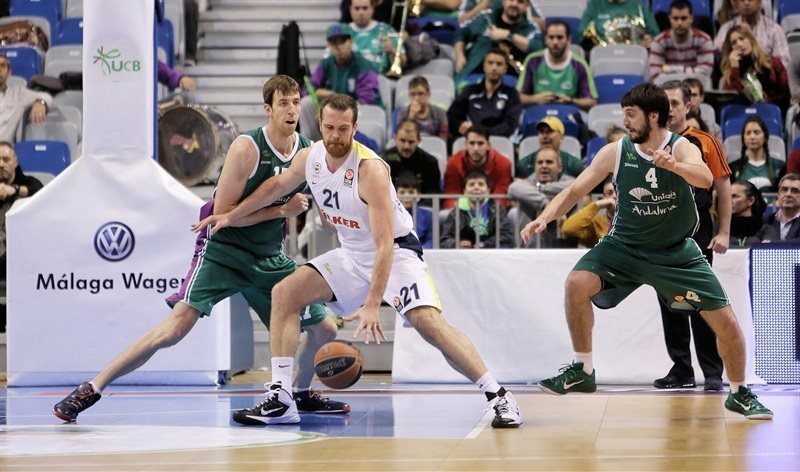 Unicaja rallied within a single point behind Jayson Granger and Carlos Suarez, but Jan Vesely and Nemanja Bjelica dominated the paint and scored clutch baskets, helping Fenerbahce hold on. 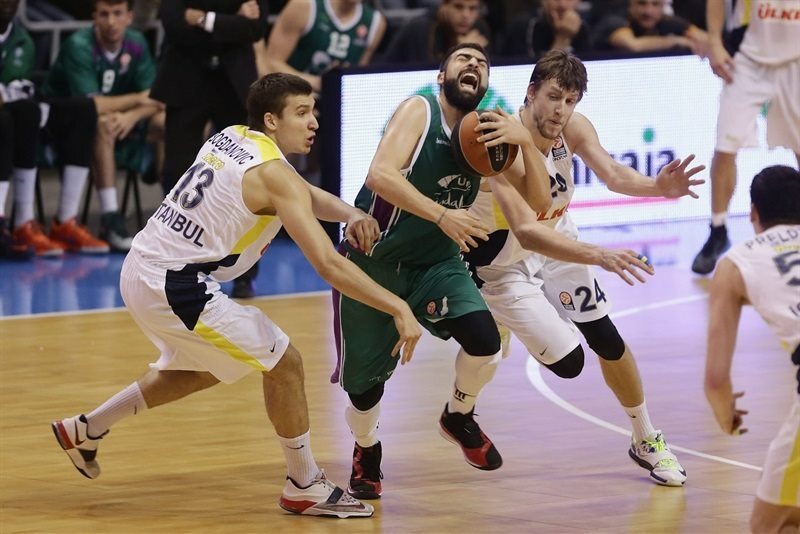 Vesely collected 17 points, 7 rebounds, 2 blocks and 3 steals, while Bjelica amassed 14 points plus 13 rebounds in victory. Jon Stefansson paced Unicaja with 13 points, Fran Vazquez had 12 points, Suarez scored 9, while most of Granger's contribution – 6 points, 4 steals and 4 assists – came in the final quarter. Stefan Markovic fed Vazquez for an alley-oop dunk that proved to be the only basket by either team in the opening 3 minutes of the game. 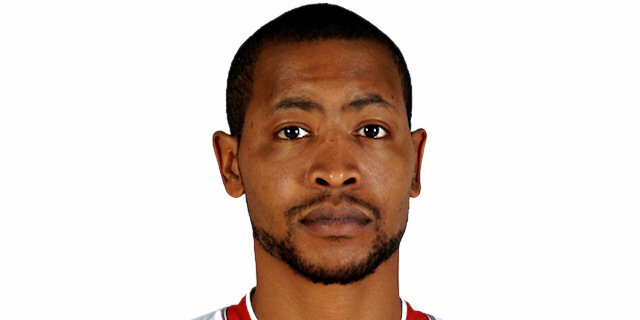 Fenerbahce was held scoreless for almost 4 minutes before Goudelock banked in a floater and followed it with a drive to the hoop for his team's first lead, 2-4. Stefansson scored a tough layup and made a pair of free throws, but baskets continued to come few and far between for couple more minutes. 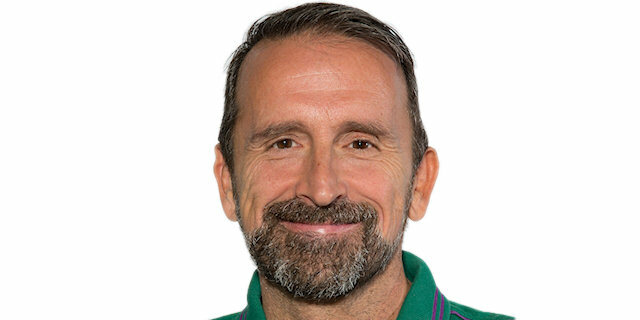 Vladimir Golubovic put Unicaja ahead 8-4 from the foul line before Emir Preldzic scored from close range to end the visitors' drought. Stefansson buried a triple, and after Preldzic scored an easy layup, Carlos Suarez knocked down his own shot from downtown for a 14-8 Unicaja edge. Scoring definitely picked up when Goudelock sank a three for Fener, then Stefansson and Bjelica traded triples. In the final minute Caleb Green made a put-back and Nikos Zisis drove for a layup as Unicaja led 19-16 after one quarter. Vesely entered the game at the start of the second quarter and needed just 13 seconds to score a baseline layup in traffic. 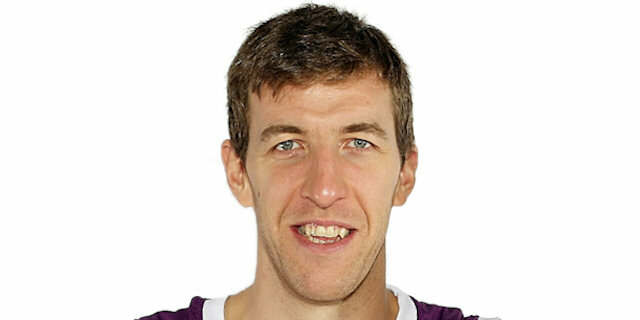 Fenerbahce regained the lead, 19-20, with a layup from Luka Zoric on the ensuing possession, before Green and Vesely traded easy fastbreak baskets. Both defenses toughened up again, and in a span of 3 minutes allowed only a single basket fell, an alley-oop dunk by Vazquez for a new Unicaja lead, 23-22. After Goudelock and Mindaugas Kuzminskas traded baskets from close range, Kuzminskas followed his with a dunk-plus-free throw at 28-24. Vesely finished a fast break with his own dunk and, after Kuzminskas scored inside, ran the floor for another layup that cut the deficit to 30-28 at halftime. Bjelica opened the third quarter with a game-tying layup before Bogdan Bogdanovic, after a couple offensive rebounds by Fenerbahce, took the lead from long range, 30-33. 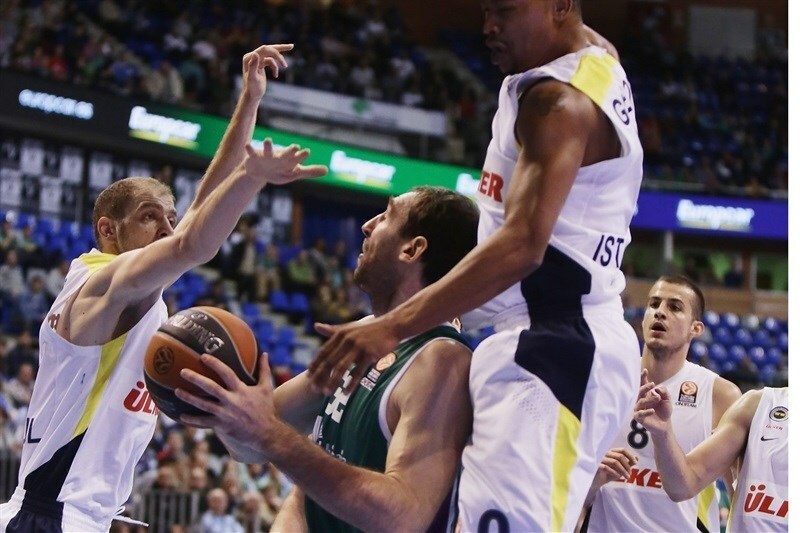 Markovic scored a tough layup for Unicaja, but Goudelock answered with a floater and added a pair of free throws. Bjelica capped Fenerbahce's 2-11 run with an uncontested dunk at 32-39. After a timeout, Stefansson hit his third three-pointer for the hosts, Suarez finished a fastbreak with a layup and Golubovic tied the game at 39-39 with a layup of his own. But Goudelock hit a tough triple and Vesely made a steal then scored on a fastbreak to spark another run from Fenerbahce. Zoric pump-faked and drove to score a contested layup, then Goudelock nailed another three-pointer for a 1-10 run that gave the visitors 40-49 advantage after three quarters. Vazquez made free throws to start the final quarter and then beat the shot-clock with a baseline floater to get Unicaja within 44-49. Fenerbahce needed almost 3 minutes to resume scoring when Bjelica sank a jumper, but Granger answered right back for Unicaja. The teams caught a little bit of offensive rhythm as Vesely and Granger traded layups, before Vesely used assist from Bjelica for a monster two-handed slam at 48-55. Suarez scored a pair of layups for the hosts, also forcing Vesely to commit its fourth personal foul with 5 minutes to go, then a tip-in from Vazquez cut it the difference to 54-55. 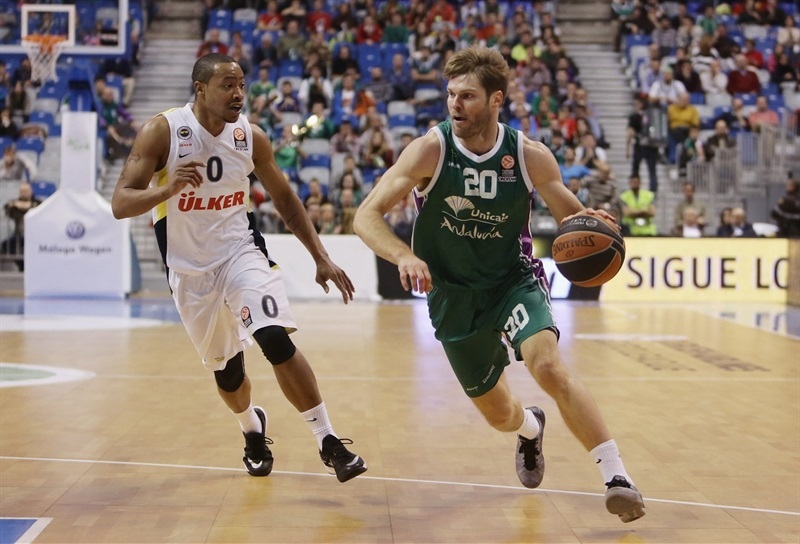 Unicaja played a 2-3 zone, but Vesely found his way through it for a layup-plus-free throw to give the visitors some breathing room. 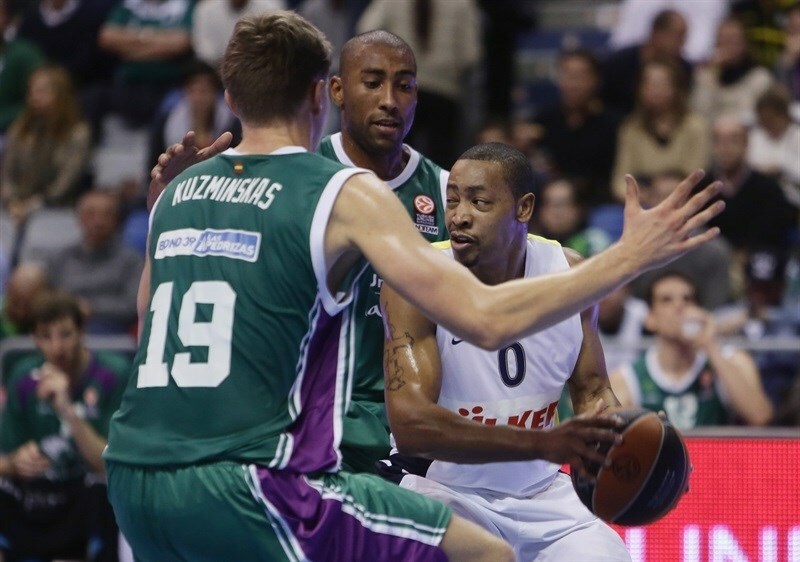 Vazquez used a miss-match with Goudelock for a short two-pointer, but Bjelica answered with a long baseline jumper. The visitors made couple defensive stands, which led to an easy fastbreak dunk for Bjelica, before a technical foul against Vazquez led to a Goudelock free throw and 56-63 lead. Unicaja used aggressive full-court pressure and traps to force 3 consecutive steals, leading to Toolson free throws and a Granger layup at 60-63. 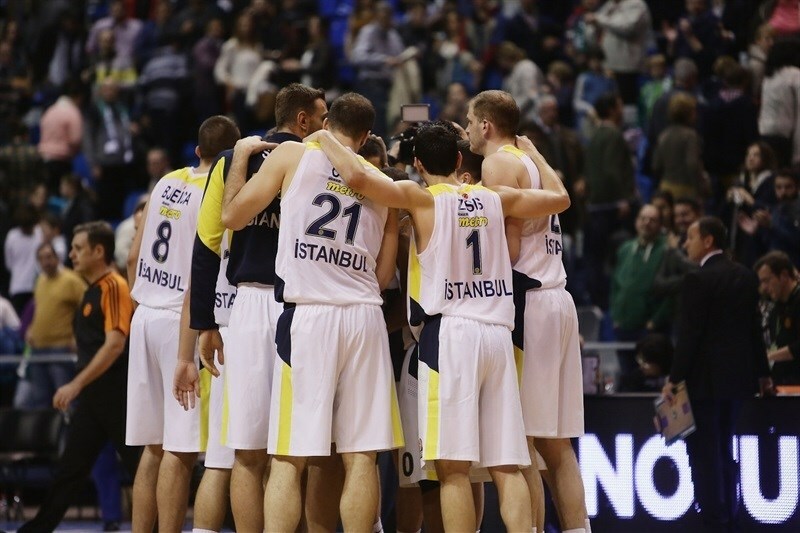 But the hosts did not score again, while Bjelica split free throws and Bogdanovic made 4 of 4 to ice the game. 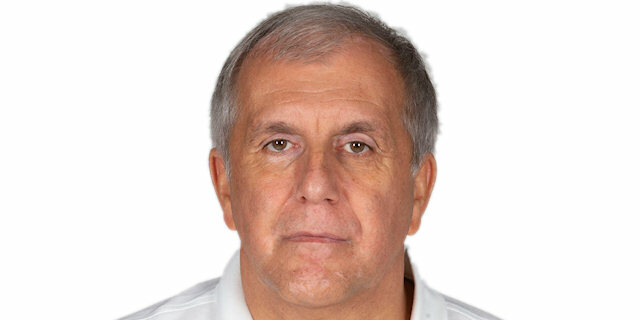 "No objection to the effort and will of the players. We had a bad shooting percentage in two-pointers and that fact has penalized us. We reached the end of the game with options to win despite the bad percentages we were shooting. Goudelock, Bjelica and Vesely are very talented players. They have scorers around them. We have to recognize their achievements. Now, we have to rest and regroup. On Sunday, we expect another Euroleague team in the ACB. Overall, despite having such an unfavorable record, nobody can relax when they play us. Now we must be optimistic but also realistic. We must pursue and persevere until the last moment." "We played a tough game, as expected. We knew that Unicaja was going to be very aggressive in their play and that they would try to get their first win at this stage of the Euroleague. Although they have lost all their games, they could have won them all and they are playing very well. They have competed in every game and always had options for victory. Talking about the match, they got many offensive rebounds and that caused us problems. In the second half, we were better and we controlled the rebounds better. We have won an important game. Congratulations to my players. 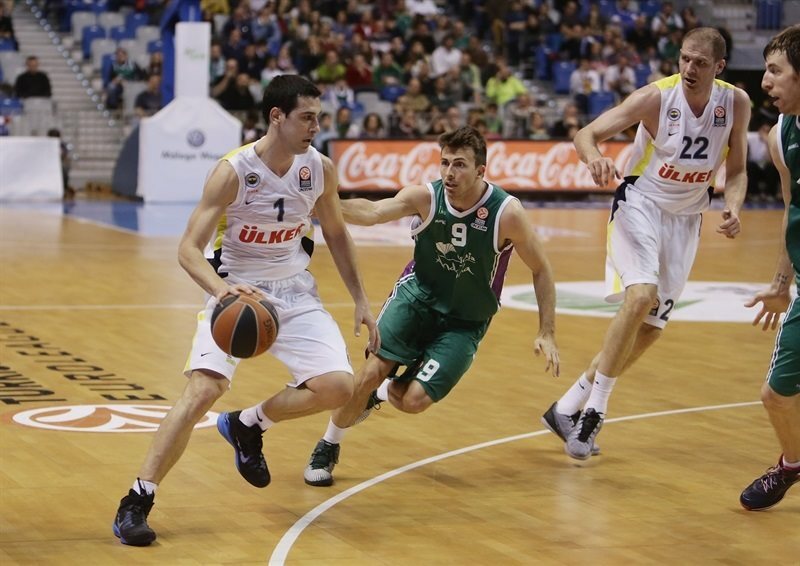 Congratulations to Unicaja because they are having a great season." "It was a tough match. For us it was important to get this win, but it hasn't happened. We played intense and tried to win until the end. The score was very even throughout the game and at the end was decided by a few points. We have had bad percentages in two-point shot and maybe that was key to not winning. Despite having no victory in the Top 16, we go to every game with the same idea, to be better. We competed in every game in a group with great teams." "It is very important to win this type of games. Every win we get is another step for us towards the next round. We wanted to come in here and fight. They are a good offensive rebounding team, they play really hard. I think we did a good job in the second half. They only scored 60 points, and that’s how we want to play defense. We didn't get a significant difference on the scoreboard, but we moved the ball well and we have been patient. In the second half, especially in the third quarter, we were more successful. At the end we were concentrating when they pressed and with their zone defense. We are very happy to win here in Malaga."